I felt like a school girl in this outfit - but I loved everything about it. I'm embracing more of the colors in my closet and have wanted to pull this dress out to wear (worn as a skirt here). It's finally Friday and I'm feeling a bit better even a day later after this post. Expressing one's feelings can do wonders for the mind! Happy Friday! So cute! love your yellow skirt a lot! LOVE this look! 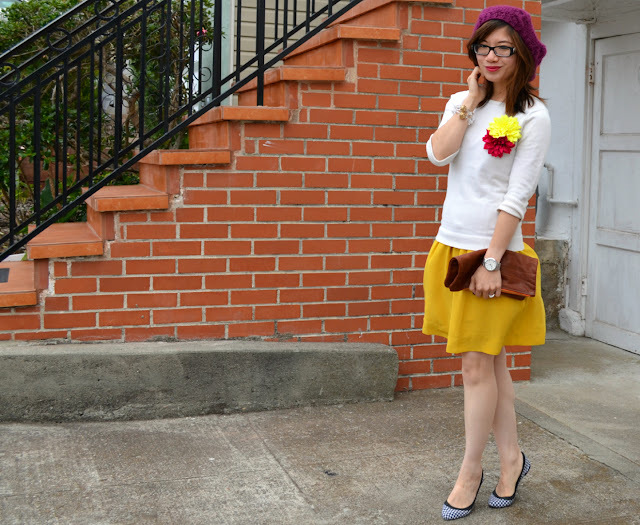 That yellow skirt is soo fab! Great color combo! bright yellow and purple and b&w shoes.... oooo... they work PERFECTLY together! I always find this particular length of skirt SO tough to pull off but you've made it look flattering and elegant here... even though it's YELLOW!! Big congratulations for that; that's a tough one to pull off! What inspired you to pair the outfit with the black and white flats?